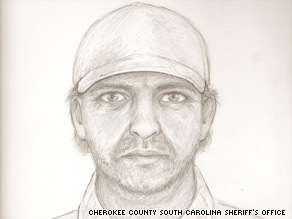 (CNN) -- The Cherokee County Sheriff's Office on Friday released a second sketch of a man believed to have fatally shot four people in less than a week near Gaffney, South Carolina. Police say the suspect may be driving a light-gray or champagne tan 1991-1994 two-door Ford Explorer. "Let me say that, under the FBI's definition of a serial killer, yes, we have a serial killer," Sheriff Bill Blanton told reporters in Gaffney, a town in the county of about 54,000 residents some 50 miles southwest of Charlotte, North Carolina. He would not detail what has led investigators to conclude the shootings are linked or how they received the description of the suspect that has led to the two sketches. In addition, he said he did not know whether the shooter knew his victims or whether he may have chosen them at random. Police said he may be driving a light-gray or champagne tan 1991-1994 two-door Ford Explorer. The first shooting happened Saturday, when peach farmer Kline W. Cash, 63, was found dead by his wife in their home, said Leigh Caldwell, a victims services coordinator for the sheriff's office. Blanton said Cash's home may have been robbed. On Wednesday, the bound and shot bodies of 83-year-old Hazel Linder and her 50-year-old daughter, Gena Linder Parker, were found in the mother's home, where she lived alone. "We're still trying to determine if anything's missing from there," Blanton said. Thursday night brought two more shooting victims -- 45-year-old Stephen Tyler was found shot dead and his 15-year-old daughter wounded in the family-run furniture and appliance store, Tyler Home Center, said Chief Rick Turner of the Gaffney Police Department. He would not say whether the Tylers were bound. The daughter remained hospitalized Friday, Caldwell said. Leave has been canceled for all members of the Police Department and the Sheriff's Department, said their respective chiefs, who urged residents to take precautions. About 100 investigators from North and South Carolina were working the case, Blanton said. "I think our community has a right to be concerned," he said. "We're concerned. We're dealing with a man that's killed four people." He urged residents to check on relatives, especially those who live alone. "We're asking the people in our community to be vigilant, to report anything." But he cautioned against taking that too far. "Our concern is that people are going to start shooting at shadows," he said. In a separate incident, police looking for the shooter tried to stop a dark SUV Chevrolet Blazer and wound up with yet another killing, this one apparently self-inflicted. "The driver, who the officer didn't know at the time was a female, pulled over," Blanton said. "The passenger door opened; two children got out with their hands up." The children were in their early teens, he said. "The mother takes off. The officer gives chase thinking maybe she's the suspect. Shots were fired during the chase." As police cars converged on the SUV, "Somewhere in the middle she takes her own life," he said. "Right now, we're working it as a self-inflicted gunshot wound, suicide." Blanton said narcotics were found in the car driven by the woman, whom he identified as a 35-year-old woman from nearby Blacksburg, South Carolina.